Knowing of your expertise, especially on AMAL gas injectors, I wonder if you could please advise on my comments below? 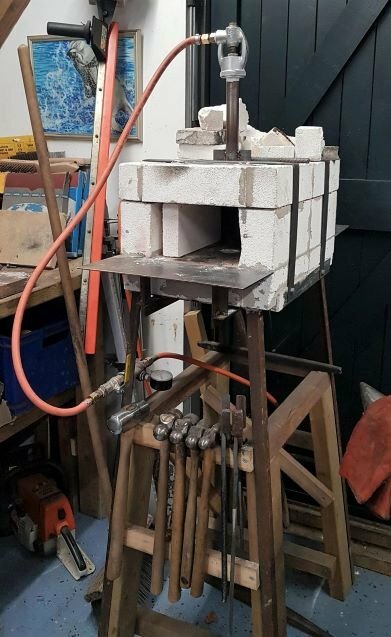 I have built a forge from Vitcas Grade 28 Insulating Fire Bricks; the aperture (as originally constructed) measures 7.5” w x 4.75”h x 18” l (195 x 120 x 460) and have been using it for a couple of years without problems. I use a ¾” AMAL injector (on a burner made to the well-proven design) by simply locating it into the front of the forge to heat the forge where required. For forging mono steel and pre-made san mai this works fine and I have successfully forged blades in a wide range of carbon and stainless steels. I recently hand-forged some san mai (140mm x 35mm x 3mm pieces) from spring steel/mild steel as a test piece and found that there was incomplete fusion in some small areas; I put this down to insufficient heating but it could of course be poor hammering technique. I don’t have a power hammer as I can’t stand the noise and our neighbours certainly couldn’t! 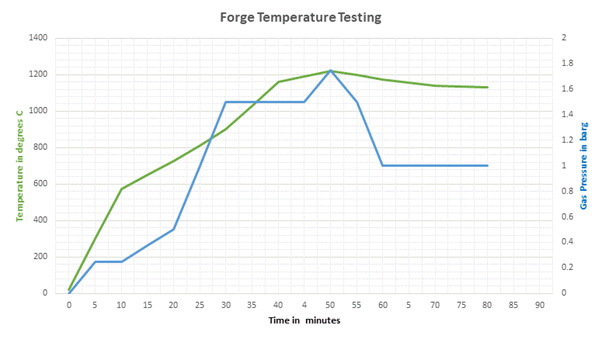 But, the attraction of forging my own san mai and Damascus is growing so I’ve given thought to my forge’s capability hence the performance test. Additionally, I am contemplating building a hydraulic press. In addition to the AMAL burner, a year ago I bought a ¾” T-Rex burner from Hybrid Burners to evaluate against it, I concluded that the T-Rex has no performance advantage over the AMAL. So, last weekend I modified my AMAL by adding the support tags, bored a hole into the forge top, reduced the forge volume (only by blocking which is not substantive but guess the reduced length helped) to 6.25” wide x 4.75” high x 12” deep (155 x 120 x 305) and then ran some tests the results of which are graphed below. I monitored the temperatures with a thermocouple the tip of which just protruded into the top of the chamber. As you see, the maximum temperature I eventually reached was 1220 at a gas pressure of 1.75barg. The latent heat in the blocks kept the temperature quite high even after I had reduced the gas pressure; I ended the test at 80 minutes. This is such a wide area that I hope these few questions will set my development path and would appreciate any comments or suggestions.